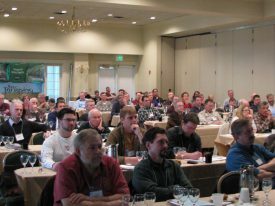 Share the post "Grape Expectations Wine Symposium Brings Together Both Professional and Amateur Oenophiles and Growers"
Grapes Vines at the New Jersey Center for Wine Research and Education. The 33rd annual Grape Expectations Symposium was held on March 4, 2017 at the Forsgate Country Club in Jamesburg, NJ where it’s been held for 20 years. The Symposium addresses the challenges of growing grapes in the Mid-Atlantic region and is a daylong series of lectures in viticulture (grape growing), enology (wine making) and marketing. Lecturers include current Rutgers Extension faculty and outside professionals. Sessions are designed to present relevant information to both professionals and amateurs involved with any aspect of grape growing or the wine industry. The 33rd annual Grape Expectations Symposium at the Forsgate Country Club in Jamesburg, NJ. Denise Gardner, CSW, extension enologist from Penn State University kicked off the morning session with a discussion and demonstration of the faults that can occur during the wine making process and the methodology to avoid these faults. The morning session concluded with presentations from three winemakers that had won the Best of Show awards in the 2016 NJ Wine Competition, chaired by Gary C. Pavlis, agricultural agent from Atlantic County. This long-standing tradition provides an opportunity for the winning winemakers to present their winning wines, discussing how the wines were made in an effort to pass their knowledge on to the members of the wine industry. The afternoon consisted of two concurrent sessions. One addressed both disease and insects pests of wine grapes. Disease topics were presented by Wayne Wilcox, pathologist from Cornell University and Peter Oudemans, professor of Plant Pathology with RCE. Dr. Ann Nielsen, professor of Entomology with RCE addressed the management of key grape pests in the vineyard. The other session presented research findings from work conducted by Hemant Gohil, agricultural agent from Gloucester County, which identified grape varieties that survived the extreme winters of 2013/2014 and 2014/2015. These varieties and their growth characteristics were described in depth by Gohil. The symposium concluded with a social in which many New Jersey wineries poured their latest vintages of wine for all to enjoy. 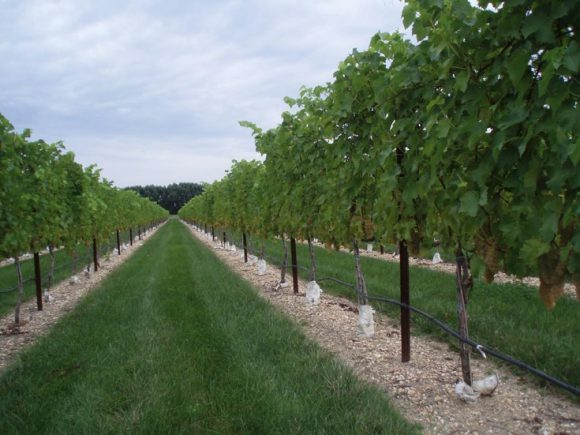 Grape Expectations is sponsored by the Rutgers Agricultural Experiment Station, the New Jersey Center for Wine Research and Education, the New Jersey Department of Agriculture, and the Garden State Winegrowers Association.